The Germany	Unemployment Rate came unchanged while the US personal income advanced to 0.3%. USD is acting weak against EUR. 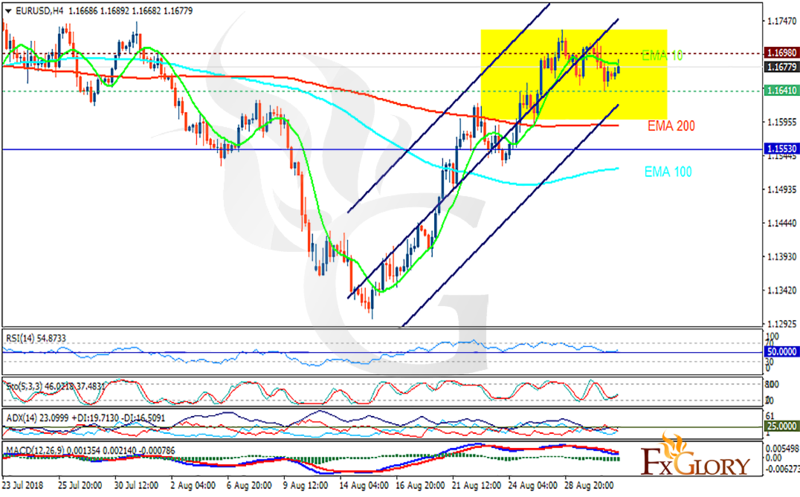 The support rests at 1.16410 with resistance at 1.16980 which both lines are above the weekly pivot point at 1.15530. The EMA of 10 is moving horizontally in the ascendant channel and it is above EMA of 200 and the EMA of 100. The RSI is moving on the 50 level, the Stochastic is moving in low ranges and the MACD line is below the signal line in the negative territory. The ADX is not showing any clear signals. The price is fluctuating within the yellow rectangle, however, the resistance level breakout will push the pair much higher towards 1.18.